Bowden cables are flexible transmitters of push, pull and rotational movements that are also suitable for bridging larger distances. The design, material and thickness of Bowden cables vary depending on the application. Due to various connection options, there are also a number of different end pieces. Bowden cables consist of a flexible or rigid inner core, a teflon slide pipe, wire sheathing and plastic sheathing to protect against rust and dirt. They are individually provided with impact buffers and adapted end pieces. Bowden cables are used in a variety of areas. They are installed as power transducers for gear changes, engine control and brakes, but also in locking and heating systems. 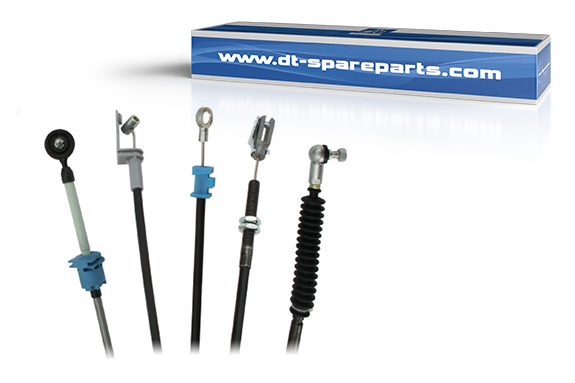 DT® Spare Parts has also the matching accessories for bowden cables like door handles, pedals, controllers, ball joints etc. available.